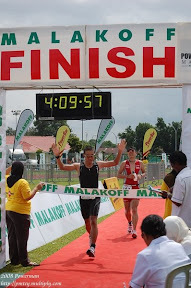 I have registered for the 1st Xterra Off-road triathlon in Kuantan Pahang Malaysia. Currently, I don't have a proper/very good mountain bike, so I just borrowed from my nephew GT Aggressor 3.0 (the bike that I used for PSK 2008) and upgrade some of the equipments. From what I have learnt from my training for the Powerman and Triathlon, I've neglected my running training and I have suffered during the race. Maybe its the mindset - I'm a runner so less running and put more effort on cycling and swimming training. So now, reprogram the brain - More efort on running and run longer than 10km. I have 9 weeks to train for my Xterra. More running. more running and more running especially trail running. Other than preparing for the Xterra, I'm currently involve in a new sport - Ultimate Frisbee. We have been playing for two sunday morning at Padang Kebajikan and its a very sweaty sports. A lot of running, jumping and frisbee throwing. Its very easy to throw the frisbee but its the game that is exhausting. Its like playing American football, Netball, Basketball all in one.